Hello Everyone! Welcome to day one of Stamp Highlights! Each day we will be showcasing each stamp set with a few projects by our fabulous design team! We are going to start with our beloved Reindeer from Reindeer Games! 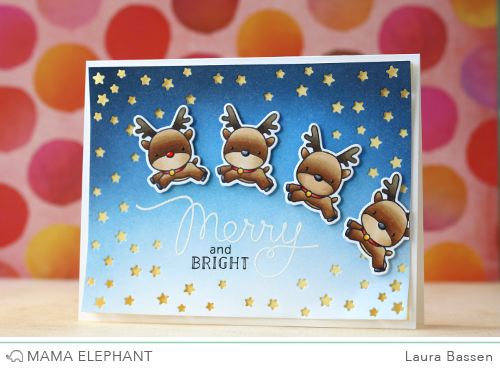 Laura used the Starburst Cover die to create this fun night sky for the reindeer to fly through. Deasy created a very fun and merry scene with the reindeer and all the little things! 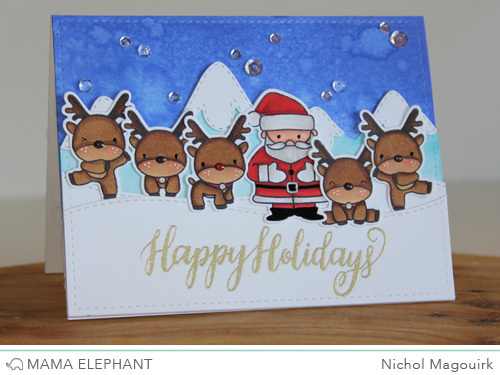 Nichol combined the Cozy Christmas Santa with the sweet reindeer for this festive Christmas scene card. Thank you for joining us today! Come back tomorrow as we highlight another set! I just adore the reindeer! There are SO many things I can do with these! I can't wait to have those reindeer in my hands, these cards are lovely! Neat set, love reindeer and all the cards are really awesome. My gosh, these are ALL adorable!! Such fun scenes! these little reindeer are so stinkin' cute. I have to get them. Oh my gosh, I love the card with the gifts. The diagonal lines look so cool! So adorable! What great ideas! Thank you. Amazing DT projects.. I must save all these card in my computer for inspiration.. And I must buy this georgeus stamps set! Beyond adorable! and yes, I definitely need these reindeer! This is such a cute set and Laura, Melania and Nichol have highlighted them beautifully. Totally adorable cards, love this stamp set. OMG these are super duper CUTE!!!!!!!!!!!!!!!!!! This is by far my favorite set!!!! How cute are these cards!!!!!! Oh my gosh these cards are adorable! I think this may be the cutest holiday stamp set I've seen from any website, anywhere. LOVE these adorable little guys!